At the moment I’m doing lot’s of things again… Back to school as a teacher, sorting pictures from my Arctic season (yes, much more to come), writing a part on time lapse photography for a book about weather photography and, if the weather is good, I try to do some time lapse photography. This week we had some nice cloud formations, so I decided to have a quick trial in a nature reserve nearby. I didn’t expect anything special, I just wanted to see how my new slider worked together with my motion control unit. Now I finally was able to move my camera smoothly while taking my time lapse. This opens a whole new series of possibilities with a lot more depth and dynamics in the image. While I was working on an HDR sunset time lapse (which failed completely, not surprising, that’s one of the most difficult time lapses), I did see a Great White Egret fly by several times, but didn’t really think anything of it. Great White Egrets used to be really rare 20 years ago, but are quite common nowadays and I knew they were seen in this area. 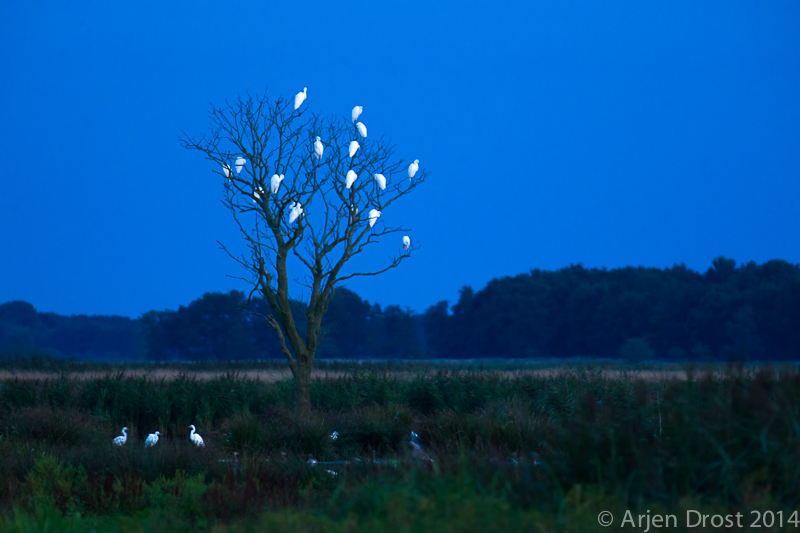 When I looked away from the sunset, I suddenly found this tree, filled with egrets. A total of 20 birds light up the tree as it being a christmas tree. A nice ending of a nice evening. And the time lapse? Well, the sunset didn’t work out, but I’m quite happy with these two fragments.